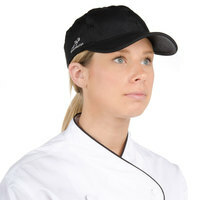 Keep your kitchen staff cool and dry in any work environment with this classic black Eventure fabric chef cap! 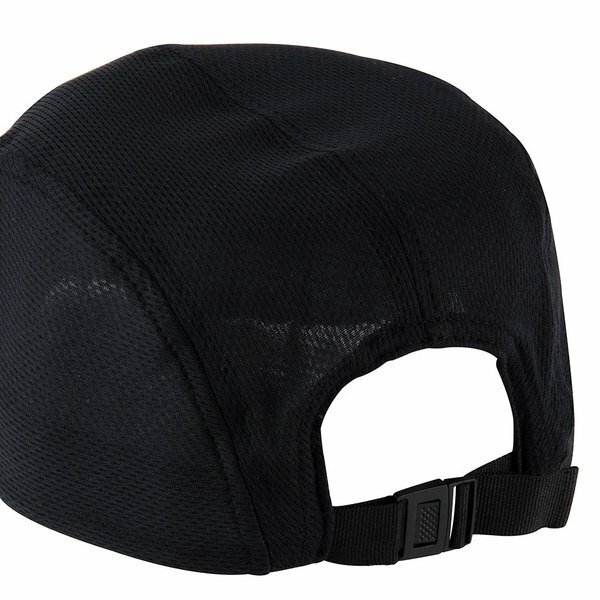 Never worry about sweat dripping on your face again when you're wearing this black Headsweats chef cap! 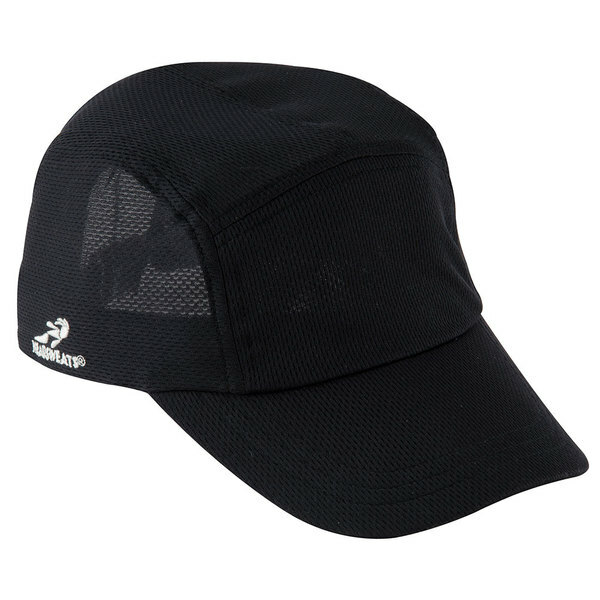 Made from a breathable Eventure fabric, this cap is crafted to provide exceptional comfort while keeping hair out of your face. This design helps keep the user feeling cooler which can boost morale and productivity in your workplace! "Have all your employees with identical clean uniforms. 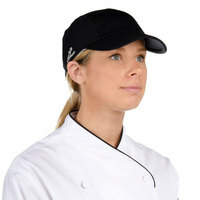 These hats are a perfect fabric chef cap that shows a sleek black color and will fit most." Made with proprietary Eventure performance fabric technology, the lightweight fabric shell provides maximum airflow, and the terry sweatband helps to keep the sweat off your face. This moisture wicking fabric produces high-quality performance in fast-paced commercial kitchens. 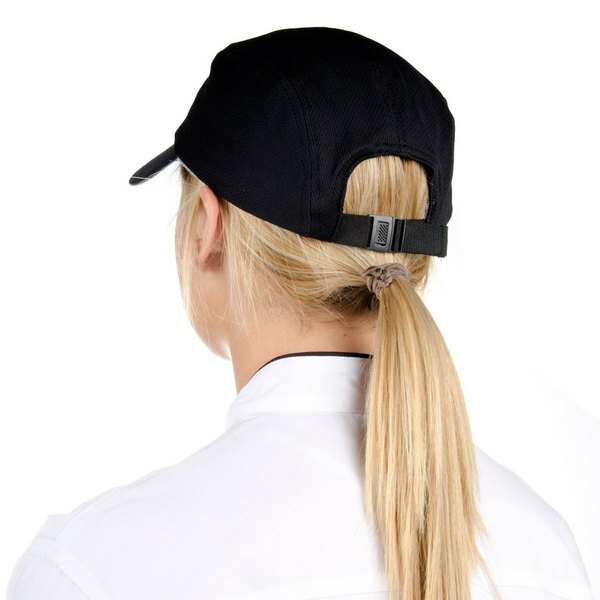 Each Headsweats chef cap also features an adjustable back closure to allow this design to comfortably fit most head sizes. Simply move the strap left or right to secure a perfect fit on the user. Snug fitting and breathes well in a hot kitchen, our staff has given us a thumbs up on the durability and comfort of this cap. Have all your employees with identical clean uniforms. 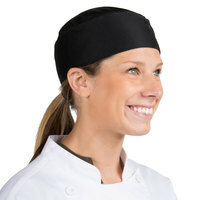 These hats are a perfect fabric chef cap that shows a sleek black color and will fit most. Wonderful hat. Looks very professional and doesn't seem to lose shape after many washes and wears. Matched all uniform types and keeps the head cool and hair back. 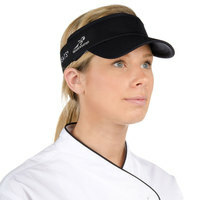 We've purchased these Headsweats Chef Caps for all of our cooks. They are lightweight and the cooks love them. And since our grill is upfront where our customers can watch the cooks, these Chef Caps look nice and professional. Great purchase. I really like these cap for using in the kitchen. Also, they look nice enough that you can wear them outside normally. Very lightweight and keeps you cool. My husband who is a chef at our restaurant loves this hat. The kitchen gets hot, especially during the summer. This is a must have while cooking. It keeps you cool, and catch's any sweat. I would buy this again. This is the greatest cooks hat avalible. It keeps your head cool. Keeps sweat from falling down your face. It is a product all cooks need. reallllly fit for running!! sulrly will wear it on my marathon run!and i will tell every my friend to get one!quiet excellent prodution!like it very much! This hat is great for keeping your cool in the kitchen. It is made with material that wicks sweat away and keeps your head cool even in the hottest kitchens. These brand name ball caps are great in the kitchen. Stylish too so you can wear them out after work and not have to worry about hat hair! Love this hat. Perfect to keep the sweat absorbed. Very comfortable. 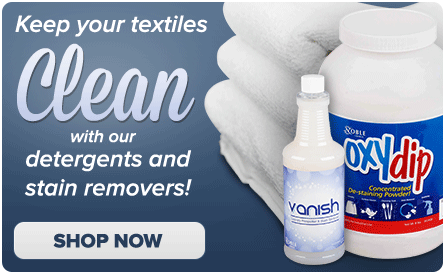 Also great materials and washes very good with anything else you need to wash.